To be truly educated read all of this information. This is research of mine and other breeders who care about the breed of the French Bulldog and for those who would bring one into their life. § protect the work of the many outstanding and responsible breeders who adhere to our breed standard. A reputable and responsible Frenchie breeder should only breed dogs conforming to his or her country’s parent club French Bulldog Breed Standard. Those irresponsible breeders who breed for and advertise rare colors are intentionally spreading unacceptable color genes through the gene pool and causing problems for reputable breeders whose main concern is to produce quality puppies that conform to our Standard. These irresponsible breeders producing fad colors are motivated by greed, since by calling their disqualified colors rare they are able to sell them for very inflated prices. Please do not intentionally buy a health problem. The following was contributed by Smokey Valley Kennels. thank you. I’m seeing an alarming trend in purebred dog breeding that disturbs me: Rare colors within a breed have become trendy. This fad isn’t new, but it is gaining traction and will be the downfall of purebred dogs, through the ignorance of breeders and owners alike. Not because they’re new, or from a hidden gene that suddenly emerged, but because they have been proven to harm the breed in some way. The same holds true with other breeds as well. , can produce yellow-eyed Frenchies with early blindness or juvenile cataracts. These are health issues that no pet parent wants to deal with, and ones that should never be imposed on an animal because a breeder wants to make money on a “rare color” or a person wants an unusual-looking pup. A good breeder will never risk a dog’s health, and a good owner has the responsibility of researching the breed they are getting. Other colors considered rare in French Bulldogs are the black and tan (like a Doberman), and the all black with no trace of brindle. These colors are so dominant that when used for breeding, will eliminate all other colors in the bloodline. It would be sad, indeed, to lose healthy fawns, brindles, creams, and pieds because a handful of unethical and uneducated people wanted blacks as well as black and tans. The blue color is the biggest trend of all for Frenchies. They’re being bred and sold so quickly that there are waiting lists for the puppies. Blues (colored like a Weimaraner) have been more of an issue with the breed than any other fad color. This color tends to produce yellow- or green-eyed dogs, which as noted above can lead to blindness. In addition, the color carries a genetic disorder that causes dry, scaly skin and hair loss. While this won’t be evident in a puppy, as the dog gets older problems will develop. Healthy dogs live longer, and cause less stress and worry for their pet parents. Setting yourself up for a lifetime of heartache, at your beloved pup’s expense, isn’t worth a designer color or a trending fad. Please do your research before buying a dog of a particular breed. Sacrificing your pet’s future health, or contributing to your favorite breed’s eventual health decline, is not worth the bragging rights of having a rare dog. These are living creatures who suffer from our stupidity — not a handbag we’ll toss aside when it gets worn. Be a responsible owner, and enjoy your dog’s long healthy years as a result. Just so you will know there are many reasons to not breed the DQ colored dogs such as health related issues and possible color dominance and also because you can't have your cake and eat it too. If you breed AKC dogs then you need to breed toThe Standard as best you can and color is an easy one to be able to avoid. when the market for them dries up. Just like the Puggles and labradoodles etc... no difference , a glut on the market and many now out of them because they can't sell the pups. But there is a real concern when it comes to color dominance which is likley one of the biggest reason all those many years ago that those colors were not acceptable. Once those colors are in the lines they take over and bring with them the problems. The only breed I know of that has blues with no skin problems are Weimaraners and even they have two coat types and two actual colors also which is likley their saving grace for skin problems. Black/ Tan is a VERY dominant color/coat pattern and liver and mouse are dilute colors and almost all dilutes no matter the breed have problems not to mention that they also bring with them other things like light pigment and light colored eyes, also DQ faults in almost every breed of dog. So add those two other things to the list of not acceptable to the breed standard and there you go again, breeding just pets now with problems to sell to the ones that are least able to handle them both emotionally and financially, the pet owners. no matter if they are pet or show. Also those colors also came from the out cross of several other breeds all those many many years ago and so if they didn't allow those colors then maybe its because they knew something we don't. They also likley didn't get for example, a terrier look or temperament if they don't have any black and tan dogs in the lines. the size or that drool! As for the solid black, it can likley easily become dominate and we would never have the lovely creams and fawns we all love not to mention the fawn and red pied. So those old folks likely DID know what they were doing and we should take heed as once they are back it would take another 200 years to get rid of it! Until the last few years as few at 5 or 7, you would never have even heard of those colors except in old info. or puppy mill stock. once crossed or mixed always such and NEVER pure. breeding the odd colors for big money to the dumb Americans willing to pay for it. ONLY AKC does DNA testing on dogs, no other countries do and AKC does only if you have over 8 litters a year. So most don't reg. the dogs with AKC. They are able they sell the pups with a different Assoc. paperwork that is able to be reg. AKC and so if the new owner wants to do so they can. Most don't but in time this will catch up with them but that breeder will be long gone. And that is another time bomb waiting to catch up with someone. We will never go there, please don't either. If a breeder tells you that blue French Bulldog puppies are rare and worth a great deal more than an ordinary coloured Frenchie, then BEWARE. Other than the person breeding specifically for blue French Bulldogs, the colour blue has no more monetary value than any other colour. This breeder is either not knowledgeable or not interested in breeding strong healthy dogs that will enhance the breed in the future. Blue, charcoal grey, or mouse are a disqualifying colours in every country that breeds them, and all are usually referred to as �blue�. The blue or charcoal grey colour is a dilution of black and is caused by the melanophilin gene (MLPH). A dog born thus affected is termed as �born blue� since it is present at birth.� Genetically, they are considered DD, Dd or dd. The colour can result from inbreeding. Many breeders learn the pedigrees of their dogs, have at least an basic understanding of the genetics that produce their dogs, and therefore avoid producing disqualifying traits. Reputable breeders try to improve the health of their dogs so they breed characteristics that will enhance the breed. Light eyes are inconsistent with a dog bred as a companion and are more likely to occur through inbreeding. Those that breed specifically for a �blue� colour overlook issues such as light eyes, skin conditions and lack of a black nose. Light eyes are inconsistent with a quality companion dog . Light eyes and the lack of a black nose are, in fact, disqualifying traits when French Bulldogs are shown. Black Hair Follicular Dysplasia and Color Dilution Alopeicia are skin conditions and are directly related to the dilute gene. These afflictions are sometimes referred to as the �Blue Dog Syndrome� and neither are a minor fault. It is also believed that a compromised immune system is related to the blue gene in more ways than just skin issues. So it is very risky to breed for this colour in French Bulldogs, and no knowledgeable and reputable breeder actively tries to produce Blue French Bulldogs. dogs expressing the recessive "blue dilution" (D/d) gene. pigments, and some of which control the pattern of distribution of these colors. Frenchies have a black mask, which is a recognized and acceptable coat. is a pattern consisting of a mixture of black hairs and fawn hairs. pigmented patches most commonly located on the head, tail base, and "saddle". to provide the brindle pattern, so that it is not the disqualified "white with black." some black and tan Frenchies, these are rarely seen. and light (red to yellow) pigments. as does the nose color. carriers (D/d), and 1/4 will be normal non-carriers (D/D). breeders can undertake to eliminate them. as acceptable colors and disqualifying colors. mouse, liver, black and tan, black and white, and white with black. have a solid black nose he must be disqualified. but can be truly described as rare and are unlikely to appear in the show ring. French Bulldog with this disqualifying color. pigment on the nose and paws) are a slatey blue-grey "mouse" color. is one) and paw pads are slatey blue-grey. color constitutes a disqualification - as does the nose color. colors and includes representative photos of these colors. CAUTION: Please click here to read our Breed Standard, which tells you what characteristics are desirable, and which are considered disqualifications. A reputable breeder will NOT breed or sell dogs with disqualifying colors. These include "blue," "liver," and black-and-tan (the coat that some dachshunds and that dobermans have). and we recommend that you seek out breeders who breed to our Standard. Even some good breeders seem to be getting the colors wrong. It is important that all breeders recognize the proper colors and resist the urge to breed for or celebrate an off color. Novelty isn�t the most important thing in a breeding program, health and welfare of the breed are. To understand why breeding for disqualifying colors is not done or maybe even unethical, one must first understand why the Original Breed Standard decided some colors were not allowed. Blue and Mouse have been genetically link to corresponding health problems. Allergies, skin conditions, deafness, blindness and others have all been shown to appear with alarming commonness in some of these colors, no matter the breed. The disqualifying colored dogs also carry with them several other disqualify faults in almost all cases, no matter what color or color combinations. Examples of this include light eyes, lack of proper color pigment and over sized dogs. If a person is breeding for the betterment of the breed, as any breeder should be, then ignoring obvious disqualifying faults would be using a double standard. Using a faulted dog in a breeding program with other quality standard dogs is nonsensical. Some may state that faulted dogs will get better in time, which could be true, but not until they have polluted in great numbers the breeds gene pool and weakened the health and reputation of the entire breed. Some also state that they are trying to �reintroduce� these colors in hopes of getting them recognized. There is no official, serious work towards this except for breeding more of them! Sadly, the motivation behind breeding these disqualifying colors seems to be to sell them at inflated prices to the novices, unlucky or unwise enough to know any better. We need to trust in the decisions and the work the founders of this breed did and their reasons for not accepting those colors. French Bulldogs were surely started with a combination of several breeds, some of which will never be known for sure. The black and tan terrier of the times is thought to be one of them. It�s possible that the dogs with those markings carried a more aggressive temperament or were more Terrier in appearance. The blues could have come from either the Italian Grey Hound, thought to be a contributor in our breed�s beginnings, or a Mastiff. Maybe those with the small greyhound lineage had poor bone and body mass and the Mastiffs influenced ones were too large or had aggressive tendencies and skin problems. Who are we to now know better than the founders and start a mess that can never be taken back? Once these Fad colors with their accompanying faults are intermixed into healthy, breed standard correct bloodlines it will be too late to ever go back. Over all there are NO legitimate reasons to add or accept these colors into the breed standard, just a very few who want to breed them strictly for profit. The market for these colors will soon be gone, leaving the breed possibility forever damaged. 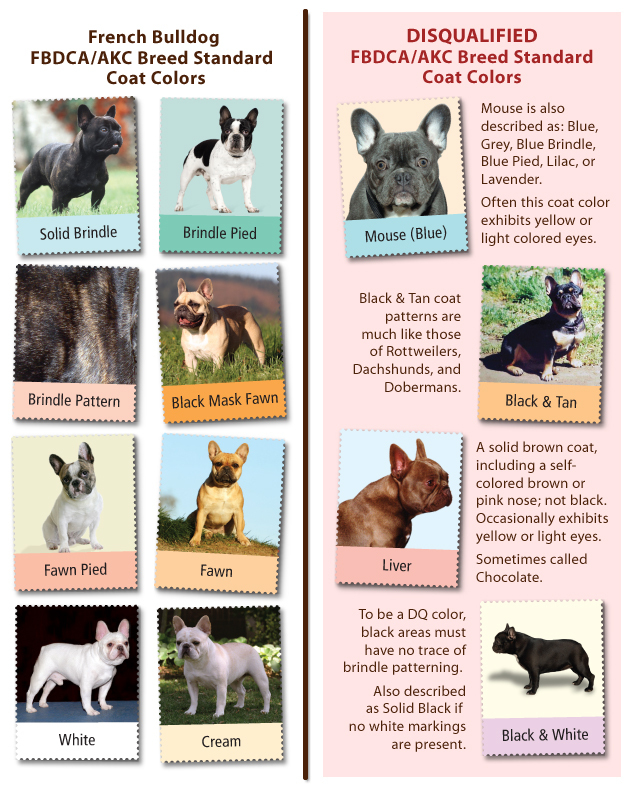 The following pictures show many disqualifying colors according to the French Bulldog Club of America and AKC Breed Standard, our breed�s Standard of Excellence. None of these colors are allowed. You�ll see a description of the color along with possible effects it could have. No brindle or lighter colored hairs, shiny like a Pug or Lab. This could become the dominate color in the breed to the exclusion of many others. This is a self pigmented dog, meaning that the skin, lips, eye rims, and pads are all that color. If they don�t have that then they are NOT a Blue. A solid dog will not have any brindle here either. If this is a dilute of black as many claim then it can cause all sorts of trouble. Blue is Mouse and is not allowed. It�s linked to the deaf gene and early blindness. This color also carries dermatological skin diseases and there are dysfunctions in many other breeds where this color exists, such as Dobermans and Neapolitan Mastiffs. This is a muddy color that comes in several shades with a black mask. It may make it impossible in time to get the wonderful clean clear, blonde fawns we now enjoy. Blue is not fawn and this is not an acceptable color and so should never be bred for. It can have the same problems as blues. As clearly stated in the name, just because your blue puppy can see and hear now doesn�t mean it won�t lose its vision or hearing as it gets older, even an unaffected dog can pass this to its offspring. Just at it states, a white dog with blue spots. Again it is a blue and also a white so can carry both possible problem genes. Why introduce that into any breeding program? This can carry any problem that an all white dog might carry or add to this mix, such as deafness and blindness and lack of pigment. Just as this name implies it�s a dog with those markings, in several color combinations, like those common to a Doberman Pincher. TOO Dominate a color/pattern, in all breeds this color shows up usually to the exclusion of all others or in combination with other colors as it is impossible to get rid of once introduced. Enjoy a photo of the only Purebred French bulldog I have even seen in person with down ears. Have seen a couple more of questionable lineage on the internet and being used in breeding programs, a BIG DQ fault in our breed. Shame on them!